Pinot Gris Grigio by Villa Maria of Marlborough. An exciting palate offering layers of juicy flavours, intensity and fullness, finishing with a refreshing crisp, clean and racy acidity. Villa Maria possess the magic touch with Pinot Gris, regularly clearing international wine events of prestigious trophies. Fruit is sourced from vineyards across a range of mesoclimes, a spectrum of flavour profiles to maintain continuity of style. A well balanced and invigorating wine, food matches are aplenty, but ideally to be served chilled with shellfish, your favourite chicken recipe or runny cheese. Founded in 1961 and still operated by George Fistonich, Villa Maria has been New Zealand's leading wine award winner, both nationally and internationally since the early 1980's. Villa Maria's talented people have an unrelenting passion to produce quality wines. Realising that it takes more than just good winemaking to produce quality, a passion to succeed begins in the vineyard. Astute site selection by Villa Maria's vineyard experts, is followed by superior vineyard management and then complemented by expert winemaking. A strong focus on continually improving the vineyards is considered by Villa Maria to be an incredibly important factor in quality winemaking. Vineyards have the highest of priority for Villa Maria whose team really does live and breathe the philosophy that it all starts in the vineyard. The grapes produced must be superb quality, as this is the essence of good winemaking. Villa Maria owns vineyards and sources grapes from contract growers from some of the best sites in three of New Zealand's leading grape growing regions; Marlborough, Hawke's Bay and Gisborne. Villa Maria Estate has two state-of-art wineries in New Zealand. 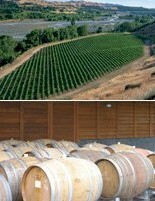 The largest is the new Auckland Winery and Vineyard Park. The Marlborough winery is based in one of New Zealand's premium grape-growing regions. The winery now crushes Villa Maria's Marlborough harvest from its vineyards and contract growers throughout the region. A new winery in Auckland was essential for Villa Maria to meet the increased domestic and export demand for wines and it has been designed to allow for long-term growth. Villa Maria also has 20 hectares of vines at the Auckland Winery site. As well as managing the company and publicly owned vineyard sites, Villa Maria's winemaking team work closely with contract growers. Villa Maria has a team of 80 dedicated contract growers in Hawke's Bay, Gisborne and Marlborough who grow grapes under the close guidance of the company’s vineyard experts. Villa Maria's viticulturists, based in all three regions, have one focus - to consistently deliver quality fruit that is physiologically ready, to the winemakers. Villa Maria was named as one of the world's 50 great wine producers by Wine Spectator. Named New Zealand Wine Company of the Year at Australia's Winestate Wine Awards for the sixth time in seven years. New Zealand Wine Producer of the Year and Best Sauvignon Blanc Trophy - 2004 International Wine and Spirit Competitions in the United Kingdom. Trophy for the Most Successful Exhibitor at the 2004 New Zealand Wine Society Royal Easter Show for the third time in four years and winemaker Alastair Maling MW, collecting the Gold Medal for Champion Winemaker of the Show. This is the third time in four years Villa Maria winemakers have won the award. George Fistonich was also short listed as one of 50 prominent figures in the wine industry by UK Wine International Magazine, named New Zealander of the year by the prestigious National Business Review, and in the top ten New Zealanders by daily newspaper, The New Zealand Herald. 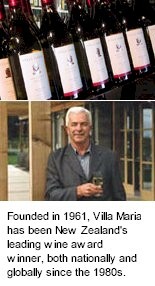 Villa Maria pioneered the development of specialist publicly owned vineyard companies in New Zealand with the setting up of Seddon and Terra Vitae Vineyards. Both companies own vineyards, which Villa Maria is contracted both to manage and source grapes from. Seddon was the first ever public vineyard company in New Zealand. Terra Vitae owns vineyards in Hawke's Bay and Marlborough. Many of the estate's Hawkes Bay red grape varietals are planted in company owned and managed vineyards in the area known as Gimblett Gravels. Now regarded as an appellation in its own right, Gimblett Gravels represents 34 wineries and winegrowers, including Villa Maria Estate. The area, which takes in the Gimblett Road, is defined both by location and by soil type. Vineyards in the Gimblett Gravels area have already produced numerous award winning red wines for Villa Maria.